Hey everyone. It's baseball night at the ol Ball Yard. As a tribute to Virginia Tech, the teams are going with an unusual uniform scheme. Auburn is in orange. Alabama is in maroon. It's an attempt to mimic the Hokies' color scheme. I thought it was pretty cool. There was a moment of silence before the game as well. There are several VT hats and shirts in the crowd tonight. Top 1: Burnside looks good. Gives up a single to Avila, but strikes out two. No problem. Bot 1: Quigley is a slow worker. I hope he doesn't last long or else we'll be here all night. He struck out Bruce Edwards on a pitch that seemed low. Edwards wasn't happy with the call. Greinke grounded out. Donaldson singled to left field. Bianucci popped out to second base. Three poor ABs; one good one. Top 2: Burnside made a mistake. After hitting Bentley, he tried to sneak a full-count changeup by Belcher. That landed over the right-field wall. The next three batters were retired without incident. I was surpried to see former Edgewood Academy star Kyle Moore starting at catcher. I think of him as a SS/3B guy. He struck out. Bot 2: Spruill singled, Brooks drew a walk after a 12-pitch at-bat, then Smith hit a homer over the wall in left field. Immediately before the pitch to Smith, Alabama coach Jim Wells met with Quigley on the mound. Must've been some swell advice. Getting worse for the Tide. Stringer and Edwards singled, Greinke drove them in with a single up the middle. Two more runs. Bianucci hit a 92-mph fastball moments later that drove in another two runs. Quigley is out. He threw 47 pitches in this inning alone. Only got two outs. A reliever by the name of Kebodeaux came in. He coaxed two quick outs. Rally over at eight runs and six hits. Top 3: Alabama managed a couple of singles, but couldn't score. Burnside hit 94 mph at one point. He's working in the 89-91 range most of the time. His breaking pitches are anywhere from 83-88. He threw one changeup: 79. Bot 3: Two strikeouts and a weak pop-up to shortstop. Weak. Top 4: Belcher pop-up to right. Smith groundout. Kyle Moore nubbed one to Burnside's right. The pitcher snagged the ball bare-handed and threw out Moore. It was an outstanding play by Burnside. Bot 4: Edwards leads off with a bunt single, steals second, advances to third on a pass ball. Greinke singles to right to score Edwards easily. That's 3 RBIs for Greinke tonight already. I'd say that's a wrap. This place is loaded with people. Haven't seen it this full in a long time. Bot 5: Mostly uneventful inning. Brooks reached on a single, then stole a base. Auburn is 4-for-4 on steal attempts tonight. I guess Kyle Moore has some work to do with his footwork. His arm looks plenty strong -- he just doesn't get the ball away quickly enough. Top 6: Matthes reached on a walk; the other three guys were retired without incident. Burnside is dominating. He's only thrown 86 pitches. Bot 6: Bianucci ripped a mammoth homer over the left-field wall with two outs. It was a majestic shot. Top 7: Sac fly by May scores one. Single by Avila scores another. Burnside's stuff is flattening out. This game is 2.5 hours old and he's probably just tired. Bot 7: Four up, three down. Not much happening. Top 8: Burnside is back out. I'm surprised. Alabama scores one after an awkward throwing error on Donaldson. Burnside is at 125 pitches. Surely that's enough for him. That's five consecutive 100+ pitch outings for Burnside. Bot 8: Bianucci went deep again -- his second homer of the game. It was good for two runs. He now has 5 RBIs. Top 9: Nothing happened. Nice win for the Tigers. ***I won't be covering Saturday's game because of family stuff. I'll be back for Sunday's game, so check out this blog for in-game updates. This is why I love covering sports. The Auburn men, strapped for size since Mamadou N'Diaye graduated six years ago, finally signed a tall player today. His name is Boubacar Sylla. He's 7-foot-1, reportedly weighs 275 pounds and averaged 2.4 points per game as a high-school junior last year. "We think Boubacar has a tremendous body, and he has been playing basketball for a long time," Lebo said. Swell. Sylla sounds just awesome. Just saw where Michigan State women's basketball coach Joanne McCallie has accepted the job at Duke. Why would Auburn people care? McCallie was an assistant coach at Auburn from 1988-92, and was coach Joe Ciampi's ace recruiter during those Final Four years. There was talk of her returning to Auburn after Ciampi retired after the 2003-04 season, but the Tigers eventually hired Nell Fortner. Speaking of Fortner, she got some seriously bad news today. Top assistant Sue Guevara took the job at Central Michigan, robbing Auburn of its best Xs-and-Os coach. Considering the Tigers' biggest problems this year seemed to center around a lack of Xs -and-Os excellence, well, Fortner better start working the phones immediately. Some of you know that I follow minor-league baseball pretty closely. I love prospects. 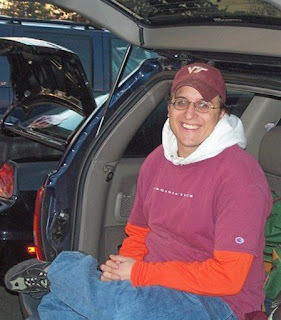 I found out last night that one of my favorite fellow minor-league enthusiasts, Brian Bluhm, was killed in the attack at Virginia Tech. Known to me usually as "VtTigers" and an active poster on my message board of choice, www.minorleagueball.com, Brian liked to share his ideas about Detroit's prospects in particular. He was a cool dude, a really level-headed guy who had strong opinions but always diffused disagreements with a laugh. I got to know him after mentioning that former Tigers great Charlie Gehringer is my favorite player of all time. He was Brian's favorite player, too. Just before a moment of silence at their game Tuesday, the Tigers mentioned Brian by name at Comerica. Tigers OF Curtis Granderson, who is my new favorite player, saw a newspaper story about Brian's love for the Tigers, contacted his family through MySpace and offered to do anything he could to help. If that's not cool, I don't know what is. Brian would be so stoked about that. Hot off the press. I'll discuss this later in the day.